It’s not even the end of October, but we already have our first snow-covered ballfield photo of the offseason. 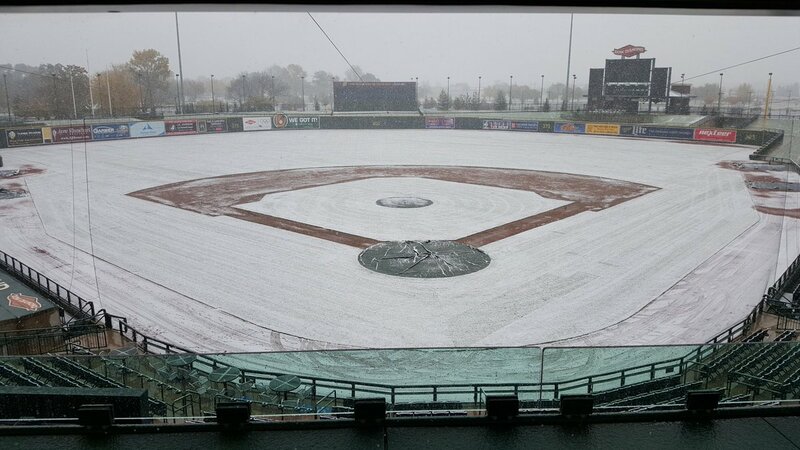 Dow Diamond, home of the 2016 Midwest League champion Great Lakes Loons, received a blanket of snow from above on Wednesday, as evidenced by the following photo shared by Loons broadcaster Christopher Vosters a couple hours before Game 2 of the World Series began in Cleveland. Normally we don’t see photos like that until after the World Series is over! Dow Diamond is located in Midland, Michigan. This entry was posted in Great Lakes Loons, Midwest League, snowbound stadiums. Bookmark the permalink.